Many schools in the UK do not have good quality athletics facilities to help kids get into sport and develop their skills in different events. We are on a mission to get long jump and triple jump run up surfaces installed in all schools across the country with help from long jump runway funding. A school in Berkshire recently asked us to build a brand new long / triple jump facility on an unused grass area, this case study outlines the construction process which was carried out. Feel free to contact our team of specialists right away if you are interested in having a facility like this built at your school or club. We’ll give you a quote for the proposed work and help create the perfect design which suits what you need. Simply complete the contact box on this page and let us know what you’re looking for. Before the installation could take place, the school first had to decide on a design and specification for the triple jump run up. We always need a clear idea of the area size, location and site access before we carry out any sport surfacing project, this helps us determine the costs and the time needed to be spent on each job. The school decided to have their triple jump run up surfaced in fibre bonded needlepunch synthetic turf. This surfacing specification is made up of artificial grass fibres which are woven together and infilled with a layer of sand to create durability and a stable surface. Many schools often opt to have the needlepunch material installed for a triple jump run up as it creates a safer landing surface than polymeric rubber which is typically used for athletics tracks. 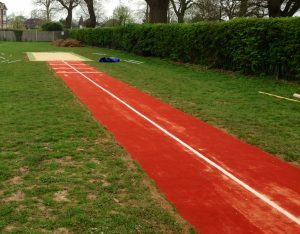 Fibre bonded artificial turf can come in different colour options but this school chose to have their triple jump run up installed in red with white line markings. As experienced sports facility contractors, we carry out the full construction process for a triple jump run up facility. The first stage of the installation is excavation of the existing ground to the specified dimensions for the runway surface and the sand pit area. Next, a geotextile membrane was laid out to prevent contamination from weeds, and timber edgings were put in place around the perimeter of the run up and the landing pit. We then installed a dynamic sub base made from angular stones which lock together to form a stable foundation which the synthetic surfacing can then be laid onto. The needlepunch synthetic turf was then rolled out like a carpet onto the sub base, secured at the edges of the triple jump run up and line marked for multi use with long jump and triple jump events. Finally the sand landing pit was installed at the end of the runway with washed and dried silica sand which creates a soft landing area for the kids once they have completed their jumps. We also supplied a sand pit cover with the installation so that the sand will be kept clean and free of any debris when the athletics facility is not in use. The school were very please with their brand new triple jump run up facility which is now being utilised to get the kids into athletics and to develop their skills in different sports and events. We have installed many facilities just like this one at schools and clubs all over the UK and we always aim to give top quality products and services at great value prices which are flexible to fit within each individual budget. If you’d like to discuss a sports surfacing project with us, please use our contact form and add as much detail as possible so one of our team members can give you some advice with regards to pricing and specifications. You can take a look at our website at https://www.sportsandsafetysurfaces.co.uk/to find out more about the other products we offer such as full sized football pitches and tennis courts, as well as maintenance services for these facilities. Have you ever thought about having a triple jump run up facility installed at your school or club? What surface type would you choose? Tell us your thoughts about this topic in the comments and please share this post if it was helpful to you, thanks!